Looking for an entrance into a reserve in the Blue Mountains I pulled us into a dead end street. I parked up and we consulted the oracle … Google maps. As we mused over which way to go next a bird flew low over the road in front of us; we disagreed as to its identification. It had settled inside a low thick pine. We waited. When it eventually made a reveal it has spontaneously multiplied into three birds. When we finally got a good look we decided they were female/immature Satin Bowerbirds. We’ve all seen wildlife documentaries showing Bowerbirds collecting blue objects. 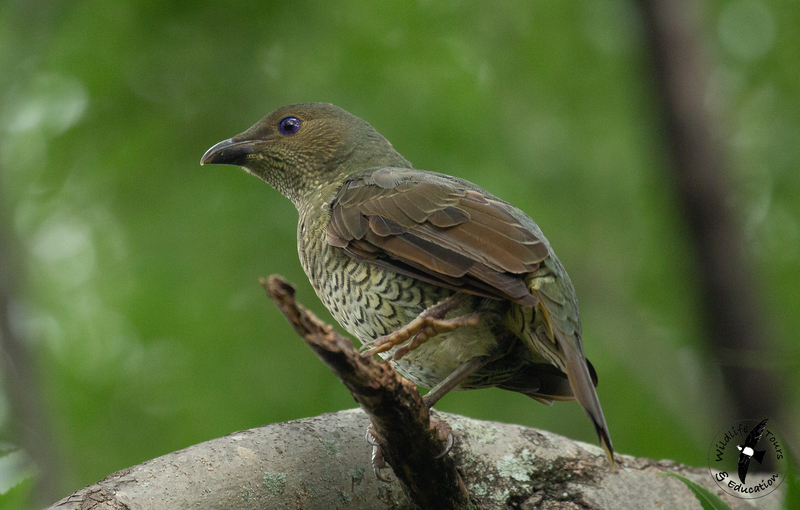 Satin Bowerbirds are no exception. Blue items to match their saphire blue eyes. 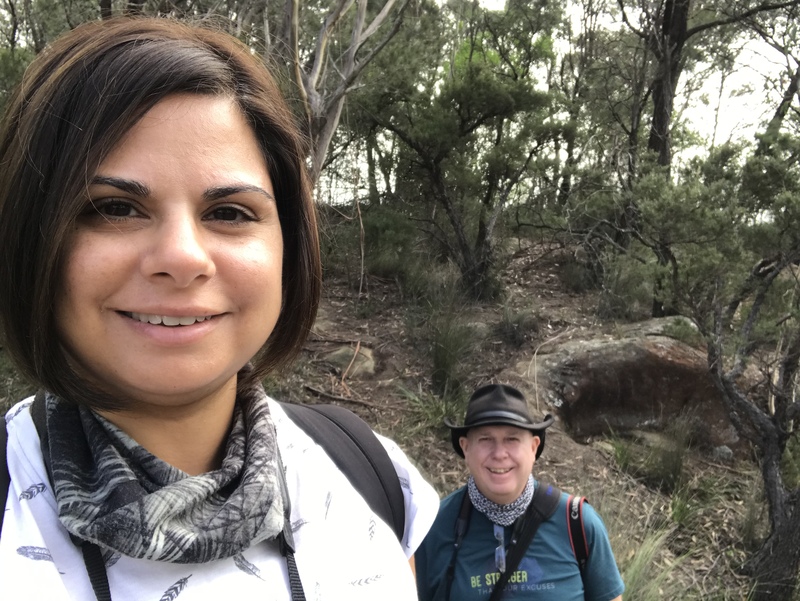 Last month Tania and I went to the Blue Mountains for a long weekend. We wanted to see King Parrots and Rock Warblers. 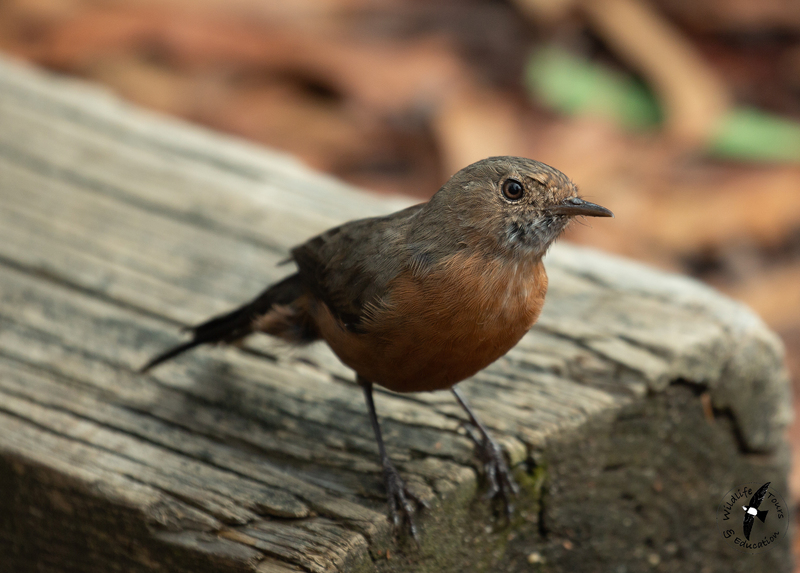 Rock Warbler is the only New South Wales Endemic. It is the only bird to occur nowhere else but in the state of NSW. The weather wasn’t the best but the landscapes are to die for. 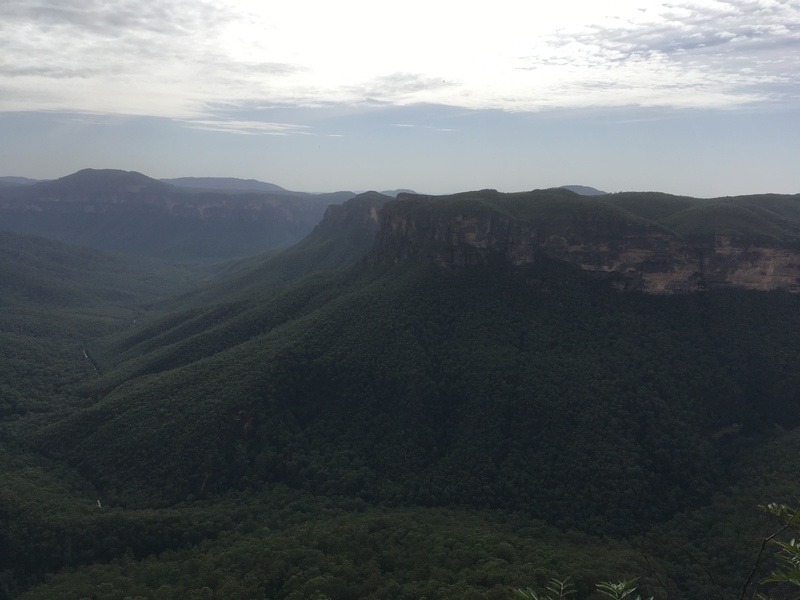 Lots of deep wooded valleys and precipitous rock escarpments in some big wild horizons. For Rock Warbler we traversed several deep and steep trails into and out of thick rain forest to see the little red breasted devil; with no joy. We walked miles. It was only on our penultimate day than we found two hanging around the area where we’d parked the bloody car! … and just to rub it in they were all over us like a cheap suit. Typical. King Parrot proved much more elusive however and we were eventually beaten by the weather with some persistent rain. Still … something to go back for! The one thing I never ever tire of is the mammals of Australia. 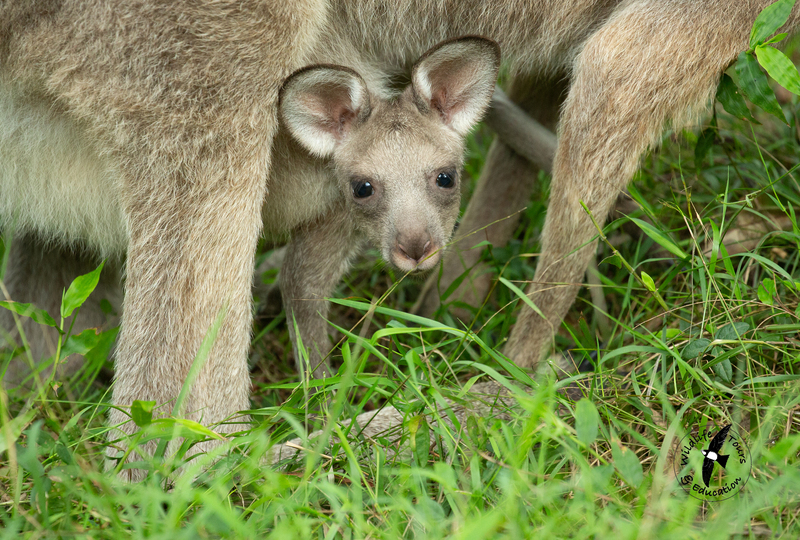 Last month I managed to get quite close to a mother Eastern Grey Kangaroo carrying a Joey. Just how big can these guys get in the pouch! Looking towards the end of the beach I could see birds roosting on distant rocks. They were far too far away to photograph. Tania and I were visiting friends to the east of Port Phillip Bay later in the day and had decided to take a look along the coast in the afternoon to see what we could find. The tide was coming in and I knew the roosting birds would have to move or they would get their feet wet. All we had to do was wait and the encroaching water should push them closer to us. There was a selection of species that settled a little nearer. 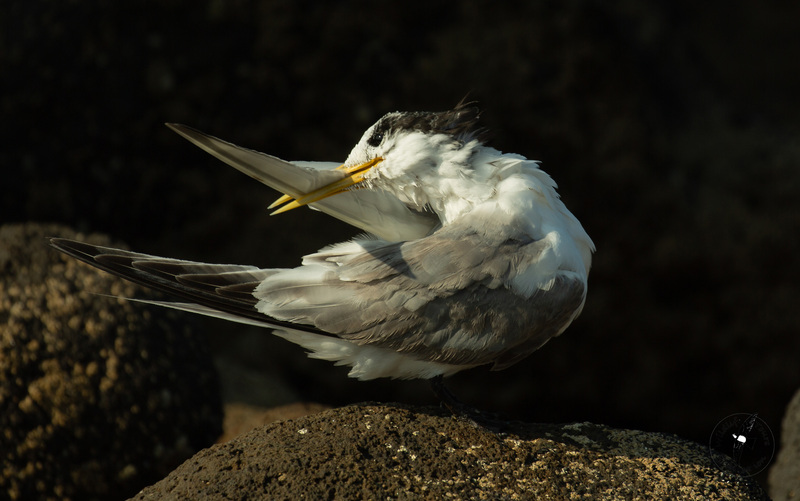 This Crested Tern was among them. It was enjoying a wash and brush up after a hard days fishing. Walking along the Werribee River a couple of weeks ago I struck up a conversation with a ground worker who was, with colleagues, trying to eradicate brambles – they are considered an invasive weed in Victoria. We had something in common in that the guy was a ‘Pommie’. He’d been in the state for around 20 something years. When I told him I was photographing wildlife along the river he asked ‘Would you like to see a snake?’ Never one to turn down a chance to photograph anything remotely wild I stated I would. 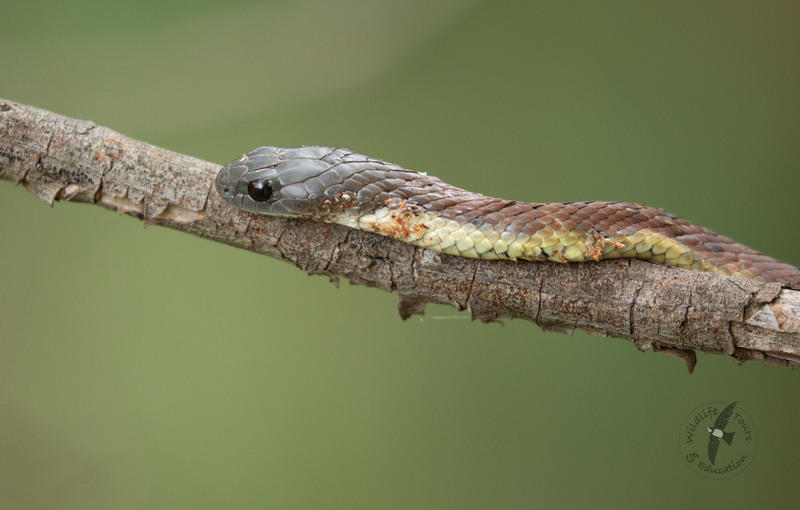 He pointed to the branch hanging over the path and calmly stated that the entwined reptile was a Tiger Snake. Now I know a little about Ozzie snakes because I’d prepared myself up-front when I started visiting Australia. 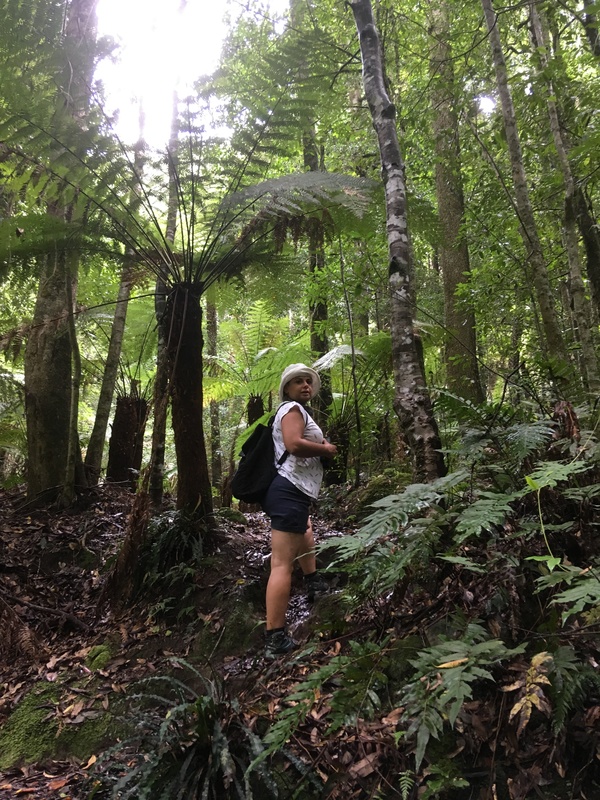 The main thing you need to remember when walking through the bush in Victoria is keep an eye on where you’re stepping and what you’re brushing up against. It’s no good skipping along with gay abandon as if you’re on a path from Larkrise to Candleford. All snakes in Victoria bar one are poisonous. There are things lurking that can kill. The Tiger Snake is the third or fourth most dangerous snake in the world. Even this youngster deserves ultimate respect. … I used a long lens!! The main arterial that punctures its way into Melbourne from the west is the Westgate Freeway. It crosses the Yara River by way of the magnificent 2.5km long Westgate Bridge. Beneath the busy roadway is a small recreational area; Westgate Park. Throughout the world there are a small number of rare lakes. 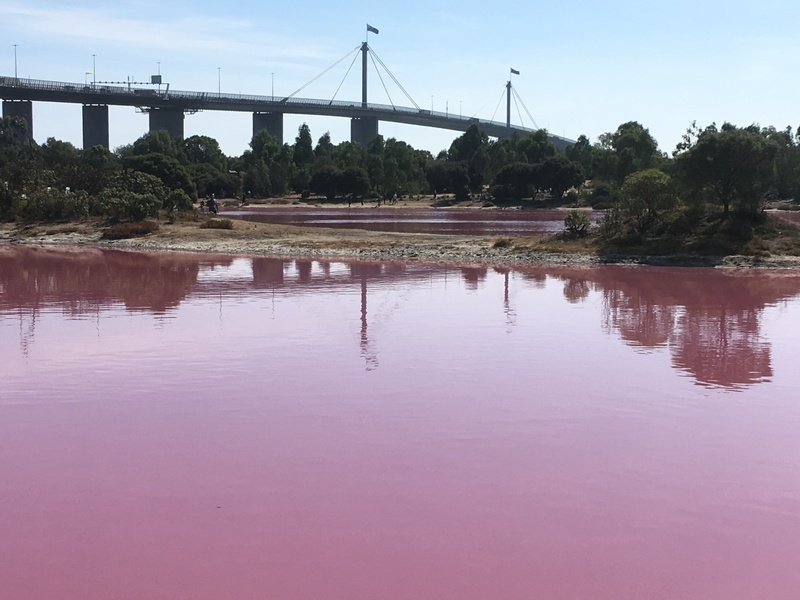 The salinity, algal and bacterial content of these lakes, when the temperature is right, turn the water pink for a while. One such ‘Pink Lake’ occasionally occurs in Westgate Park and in mid March was at its ‘pinkest’ for a long time. Tania and dropped down from the bridge to take a look. 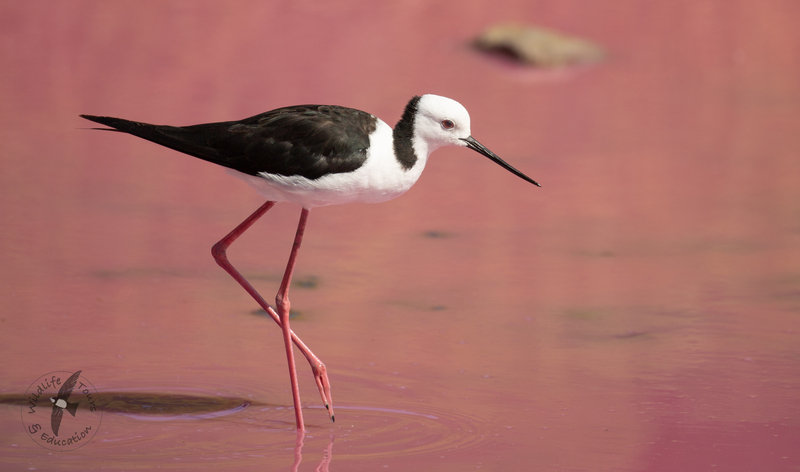 I’m not sure what was going through the mind of the the Black-winged Stilt I photographed feeding in what appeared to be a vast quantity of Strawberry Nesquik … but it certainly made a pretty picture. The UK Mammal Photographer of the Year is an award based upon an annual competition run by the Mammal Society. I don’t normally enter competitions. I’m a bit too bashful. 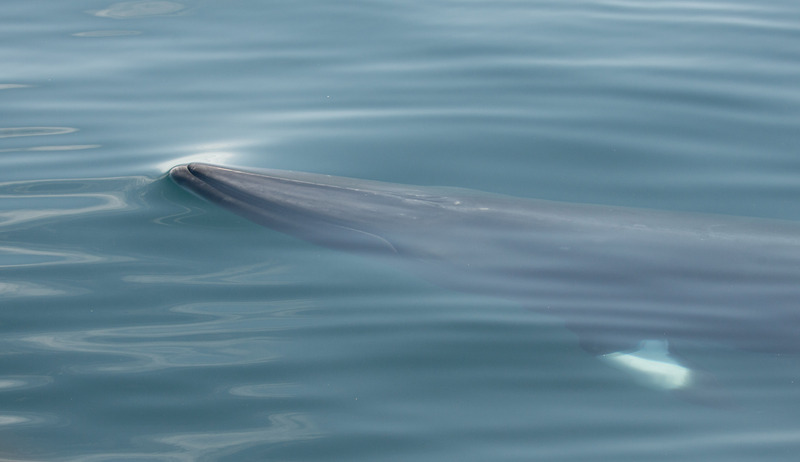 ;0) Anyways, I was talked into entering the 2019 event and I was lucky enough that my photo of a Minke Whale ‘Minke Miniscus’ taken last June, won the runners-up prize. https://www.mammal.org.uk/2019/03/did-someone-say-cheese/ gives all the details. My congratulations to the winner, Roy Rimmer, who’s photo of a mouse is lit to perfection.